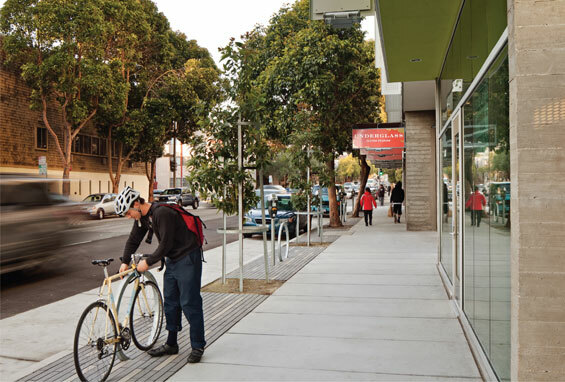 On a half-acre site in an up-and-coming San Francisco neighborhood, the Drs. Julian and Raye Richardson Apartments provide a dignified new home for formerly homeless adults. The 120-unit, GreenPoint-Rated building offers supportive services such as a counselling center, an on-site medical suite, a job training program, and employment opportunities through the building’s bakery and cafés. 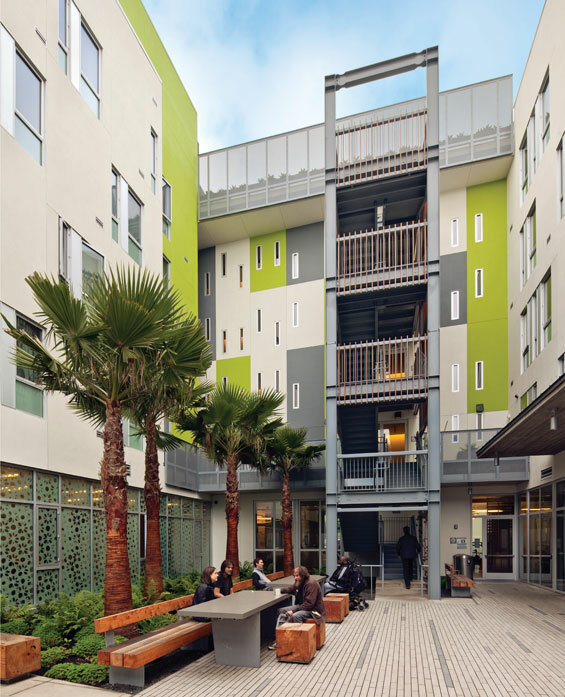 In addition to their individual studios, each with a full bathroom and kitchenette, residents enjoy common amenities such as a large courtyard garden, a roof deck, laundry facilities, a lounge, and a large community room – all fully accessible to people with disabilities. Financed by multiple public agencies, two non-profit housing organizations partnered to develop and maintain this five-story building on a former parking lot, a site that had initially been cleared by the collapse of the Central Freeway in the 1989 Loma Prieta Earthquake.The apartments are named for Drs. Julian and Raye Richardson, who founded the first African American-owned bookstore in the United States, where they strove to empower African Americans through critical discussion, education, and politics. 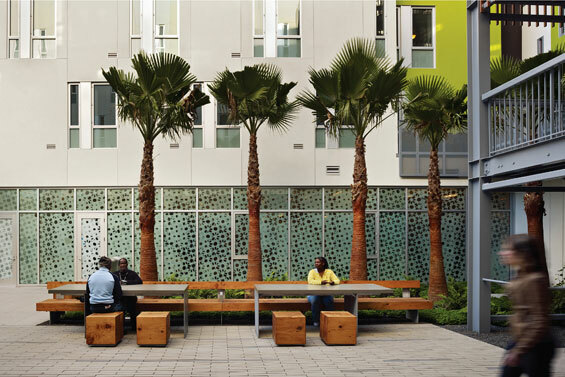 A lush, central courtyard forms the heart of the building, providing a respite from the tough streets on which residents once lived. 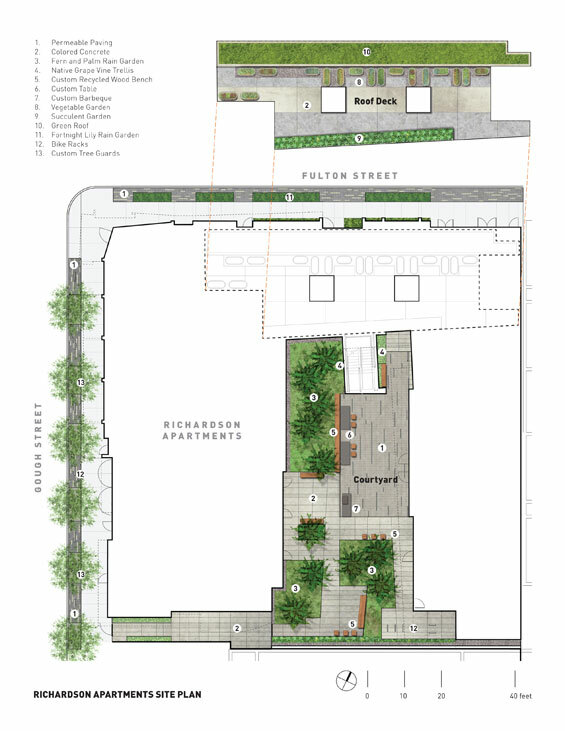 The courtyard accommodates multiple types of uses within a single space. A large patio with custom tables, benches and barbeque allows for flexible, communal gatherings, while more private areas provide seating for smaller groups or individual contemplation. The fan palms interspersed throughout the courtyard complement the narrow, vertical nature of the space and playfully engage with the residences on the floors above and the existing mural that forms the south face of the courtyard. Giant chain ferns, Japanese painted ferns, western sword fern, and wood sorrel help to create the atmosphere of a verdant oasis; they are durable, low-maintenance, and adaptable to the extreme solar conditions of full sun and deep shade. 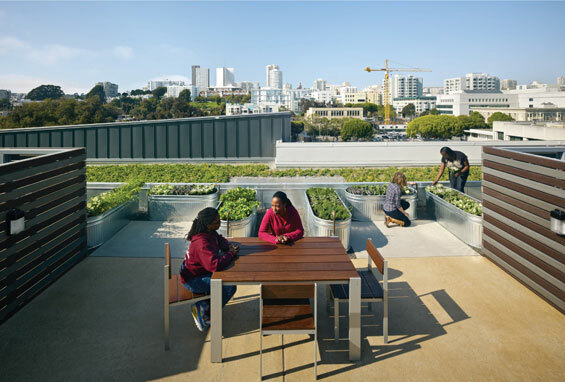 Five stories above the courtyard, a roof deck offers another healing space for residents with seating areas, succulent gardens, raised beds for vegetable gardening, and a green roof with sedums. The experience of these outdoor gardens permeates the daily life of the residents and staff through various layers of transparency. The entrance lobby connects to the courtyard through a large window that one encounters upon entering the building. Four floors of studios look down onto the courtyard below. 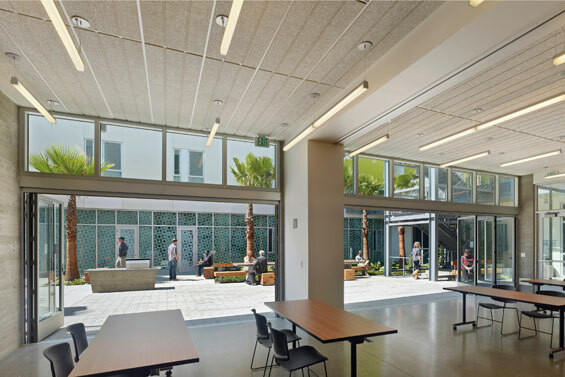 A large community room, where meals are sometimes served and classes and gatherings may occur, opens directly onto the large patio space with two large sliding NanaWalls, doubling the program area. 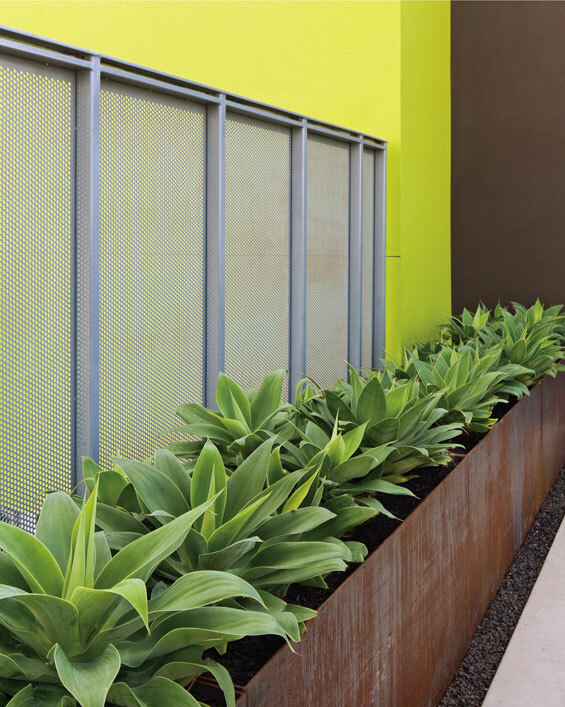 Large windows at the counseling rooms are treated with a translucent scrim which creates a visual link with the courtyard while maintaining privacy for the residents. An exterior stairwell, semi-enclosed by native grapevine trellises, exits into the courtyard and fosters chance encounters between residents. 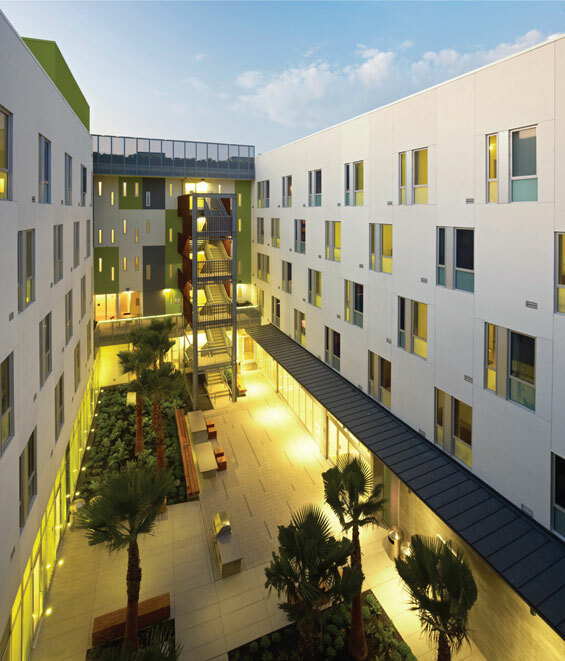 These design features help to connect the residents to one another in a healing environment. The custom courtyard furnishings, which include the tables, a built-in barbeque with counter, benches and woodblock seats, are designed to be elegant, comfortable, and extremely durable. 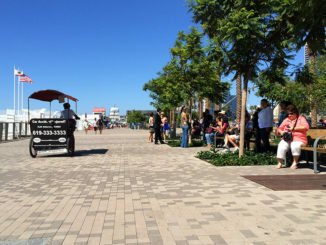 With roughly one-third of the building’s residents in wheelchairs, the landscape architects also took care to provide full accessibility in their design. 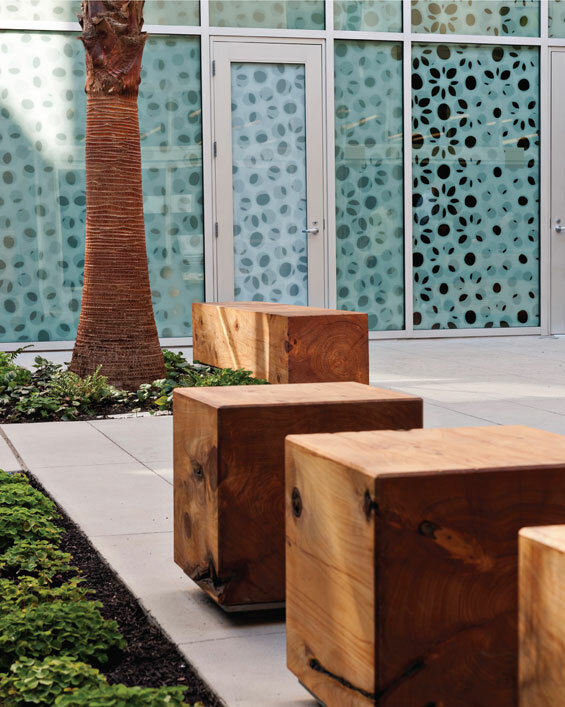 Wheelchair access is thoughtfully incorporated in the courtyard through cantilevered tables and spaces adjacent to and across from benches.The Monterey cypress logs used to fabricate the benches and block seats are reclaimed from urban forests throughout San Francisco. The wood was dried and fabricated locally and finished with a low VOC sealant. Locally sourced black basalt gravel lines drainage areas under the benches, at the perimeter of the building, and between the joints of the courtyard unit pavers, which are also fabricated in California. 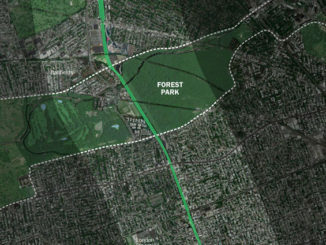 The landscape architects developed an overall site strategy to contain and maximize the infiltration of rainwater into the sandy site soils, critical for a city with a combined sewer and stormwater system. 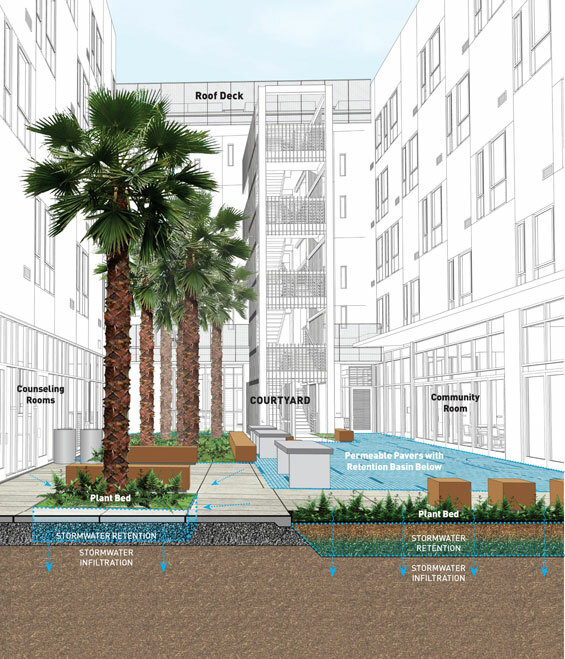 The innovative streetscape and courtyard include permeable pavers and rain gardens, which improve the aesthetics of the public realm while reducing site runoff and allowing for groundwater recharge. 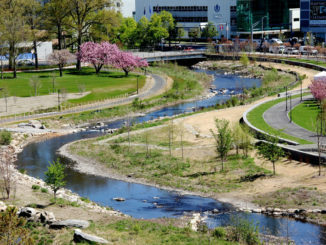 On the roof, green roofs and planters, both ornamental and edible, also help to capture water that would otherwise enter the city storm system. Despite the project’s limited budget, the design team remained committed to high quality detailing and craftsmanship throughout the process, donating time and creating innovative low-cost details to ensure that the new residents would finally feel at home.